CNC Machined 1” Shaft Big Shocks 2.25” Shocks are ideal for Custom 4-link Mega truck applications, sand cars and performance off-road vehicles. Quality, design and innovative construction provide superior suspension control and durability. 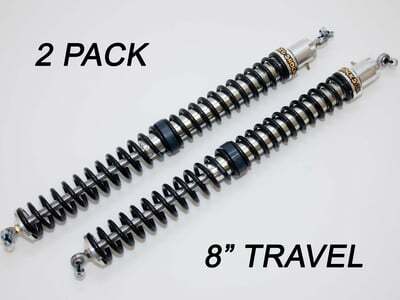 Shock travel ranges from 8” to 16” in 2” increments. All 2.25" shocks come standard with smooth alloy steel bodies, high strength 1" Hard Chrome Steel shafts and 5/8" Chrome-moly heims. MUST HAVE Limit Straps, Bump Stops, Sway Bars.